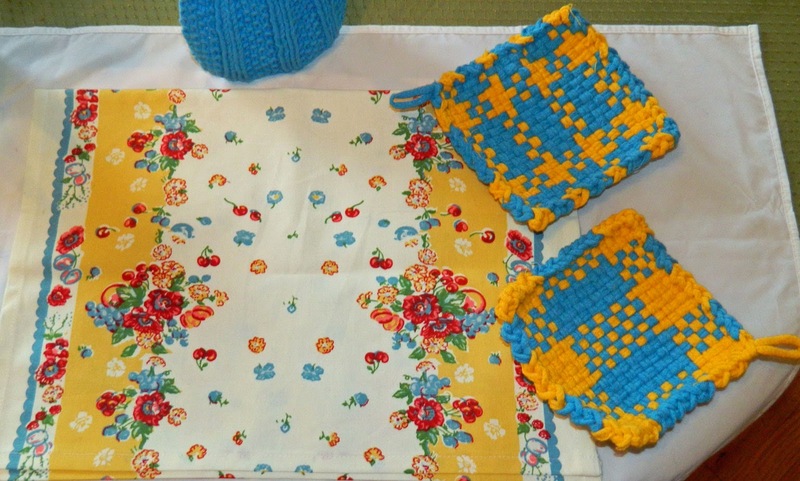 Fun colors and useful too, this set includes a cotton dishtowel, 2 woven potholders, and my signature dress style dishcloth in turquoise and yellow. I made my first potholders more than 50 years ago and I still use the same loom to weave them. I really enjoy making them and they are great in the kitchen. These are machine wash and dry and the great colors are from Harrisville Designs. 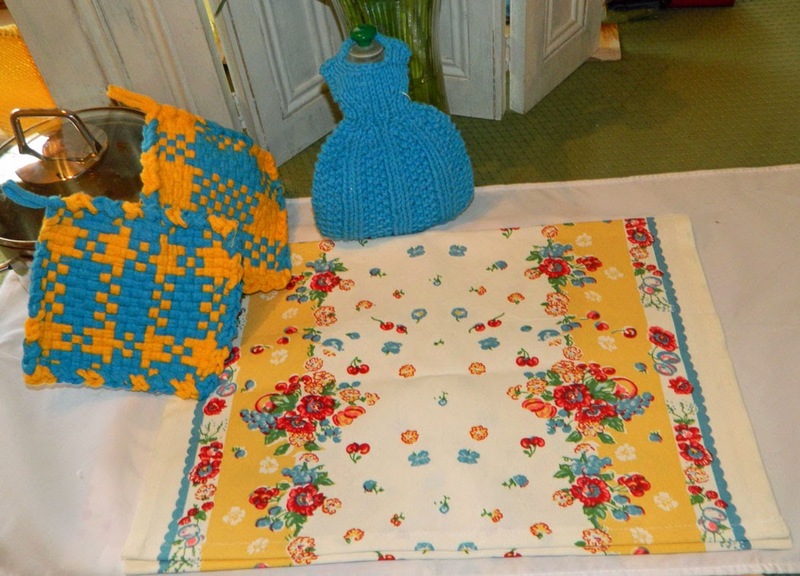 The dishtowel measures 16 inches wide and 24 inches long. It’s cotton fabric in a vintage floral print with red, yellow, and turquoise on an off white background. The dress style dishcloth is just the right size for cleaning up and it hangs over the neck of your dish detergent bottle to dry. This one is knit from my pattern Let’s go to Paris. The entire set will brighten up your kitchen just in time for Spring. Also, it’s a great gift for a new homeowner or bridal shower. 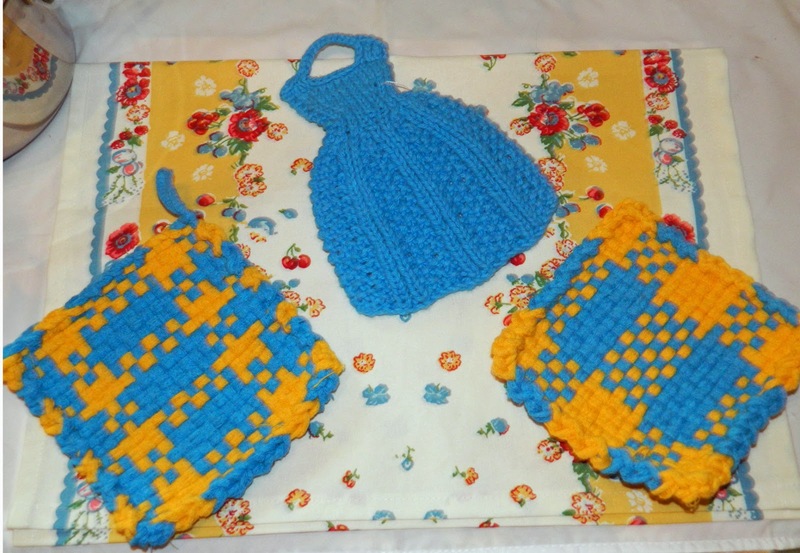 I’m busy weaving more potholders and matching them up with assorted dishtowels and knit dress style dishcloths. I’ll be adding hot pads shortly. This set is available in my Etsy shop.